Cranberry-Pear Glazed Butternut Squash With Rosemary : : Benessere Oil & Vinegar, Inc. In a large bowl whisk the olive oil and balsamic together until thoroughly combined. Add the rosemary and squash and toss to coat and combine evenly. In a large roasting pan lined with parchment, arrange the squash in a single layer, drizzling with any remaining marinade. Sprinkle liberally with sea salt and fresh ground pepper. 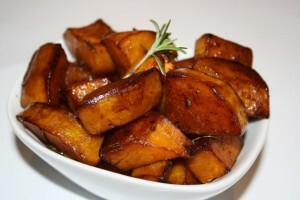 Roast the squash for 30-35 minutes, stirring a few times until golden brown and caramelized. Adjust seasoning and serve.